Now we are really moving along. 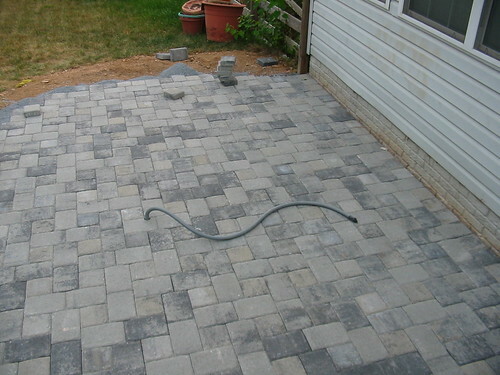 The patio is almost done: most of the center pavers are installed. The electrical feed for the tub is installed, and we are just about ready. Now just a few things remain to be done: the border needs to be installed, the stairs from the deck need to be widened, and, of course, the hot tub needs to be installed. 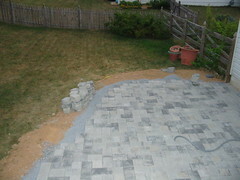 We also need to plant the shrubs that will be screening the side of the tub from the neighbors. Of course things still have not gone smoothly. Our orignal thought was to have the cover fold back to the back of the hot tub when it was in use. But of course it didn’t work out that way: the cover fold from side to side. So we could have it fold up near the house or toward the rest of the garden. We decided to have it fold toward the house. A suggestion to anyone who is buying a tub and planning the installation: be sure to check out which way the top folds! At this point I am beginning to think that maybe we will see an end to the construction soon. With any luck we should be able to enjoy the tub within a few days now. Just waiting for a few more details, like the actual delivery of the hot tub. More to follow….